Hotel near Royal Victoria Station London. 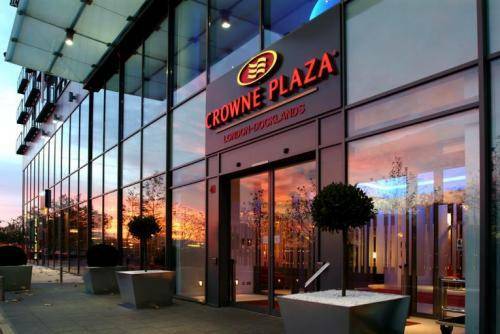 The Crowne Plaza London Docklands is a unique hotel offering contemporary accommodation, style & attention to detail. This contemporary hotel, formerly Holiday Inn, has recently been upgraded to offer even better style and service. The Crowne Plaza Docklands prides itself on offering professional, courteous service in a striking & modern environment. The charming views over Victoria Docks & across to the Millennium Dome & Canary Wharf are complemented by our own inimitable style, featuring a bold & sumptuous colour scheme, beautiful natural materials & contemporary design. In each of our 210 contemporary guest rooms, every detail has been designed to create a modern and pleasurable environment, with direct dial telephones, modem point, satellite TV with in-room movies & radio, en-suite facilities with full-size bath & power shower, modem points, tea & coffee making facilities and air conditioning. Choice linens, bathrobes and toiletries add that extra touch of luxury. The hotel houses a contemporary bar and a restaurant, accessed from the avenue or from the hotel reception. The Quad Club also offers guests a purpose-built health and fitness facility with indoor swimming pool and gym. The hotel's Business Centre provides guests, conference organisers and delegates alike with a 'virtual personal assistant'. As well as secretarial support, users have access to PCs with e-mail facilities and a range of standard Microsoft programmes, colour printing, photocopying, fax transmission, courier services and message handling. The centre can also arrange additional services such as onward and repeat booking reservations, taxi and car hire, flight assistance, translations, film developing, tour reservations and ordering props for events. Our efficient and friendly staff will ensure that you have everything you desire. Meeting Success is our self-contained conference floor with 9 modern, well-equipped rooms and a dedicated lounge, suitable for everything from one-on-one interviews to board meetings & civil weddings. All of our air-conditioned rooms have state-of-the-art equipment, natural daylight and blackout facilities. Additional equipment is available in-house and the Crowne Meetings Director can assist with your requirements. A great nights sleep guaranteed! There's no substitute for your own bed, but at Crowne Plaza London Docklands we can offer you the next best thing. Rest assured you'll be able to work or relax in comfort and sleep in peace! In our comfortable 210 guest rooms, every detail has been designed to create a modern and pleasurable environment. Many rooms offer sleeper sofas, capable of accommodating additional guests and families. All rooms boast comfortable beds, modern duvets with a pillow menu to ensure a good night's sleep. Desks and telephone points with data ports provide business travellers with a comfortable office. The smaller than usual number or rooms for a conference location ensures a high standard and intimacy of service. Non-smoking and exceptional-value Executive and Suites are also available. 3 nights for the price of 2 in a standard double room. Valid Fri-Sun, room only. CANCELLATION POLICY: Reservations must be cancelled one day in advance of your arrival date. In the event of a no show or a cancellation in breach of this policy, the cost of the entire reservation will be charged. COMMENTS: A credit card is required as a guarantee. If the booking is not cancelled outside of the cancellation notice period, your credit card will be charged with the full amount of the booking. CHILD POLICY: Children older than 18 year are considered adult for room occupancy. Children no older than 17 year can stay for free. Crowne Plaza London-Docklands is set within a stunning, waterfront environment in the dynamic & thriving Docklands. The hotel is located just a stone's throw from the western entrance of the ExCeL conference complex & adjacent to Royal Victoria Station on the Docklands Light Railway. It is also conveniently situated within five minutes of London City Airport & close to Canary Wharf. London City Airport (one mile east of Crowne Plaza London - Docklands) is the leading airport in Europe, dedicated to the business traveller. With check-in and check-out times of less than 10 minutes and being less than 5 minutes from the hotel, LCA could not be better located. Currently 9 airlines service 30 European cities, including five key hubs:- Paris, Brussels, Amsterdam, Frankfurt and Zurich. For a hotel with an international profile, the benefits of having a thriving airport on the doorstep are obvious. From London City Airport by car: Exit the airport towards the airport roundabout, then take the 2nd exit to the 2nd roundabout. At the 2nd roundabout take the first exit to the 3rd roundabout. At the 3rd roundabout take the 3rd exit. Follow this road & the signs to Excel West. At the 4th roundabout take the 3rd exit into the Excel complex. This will lead to the hotel car park. By public transport: Take the Jubilee Line on the Tube to Canning Town. Take the stairs up to the Docklands Light Railway. Take the train to Beckton on your left hand side. Alight at the next station - Royal Victoria Station. The hotel is right next to the station - it is the terracotta building with the Crowne Plaza logo. The main entrance is on the waterside.